This list of the five best data visualisations of the year, has a fantastic little tool as an honourable mention. 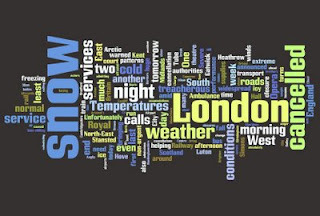 Wordle makes word clouds from any text you throw at it. I'd managed to miss it so far, which is why 'best of the year' type lists are good I guess, although I'd shuffle the order of Flowing Data's ranking a little. As a visual way of summarising what a document is about, I think it's brilliant. Seeing as London ground to a halt yesterday and people built snowmen instead of going to work, lets see what it makes of The Times website lead article. Why not run your next pitch brief through it and see if you get any surprises?